Bob Massie, Democratic candidate for governor of Massachusetts, may just be the most serious and experienced climate advocate to run for high office in this country since Al Gore ran for president in 2000. And yet the labels “climate advocate” or “environmentalist” don’t begin to capture a résumé and a life story with few, if any, comparisons. Massie launched his run on May 16 at the Armory in working-class Somerville, where he’s lived since arriving 32 years ago as a young Episcopal priest, racial-justice activist, and doctoral student at Harvard Business School. (You read that correctly.) When he entered Yale Divinity School in 1978 after graduating from Princeton, where he was a student leader in the anti-apartheid movement on American campuses, Episcopal Bishop Paul Moore told him that the church needed more people, like Massie, with a “prophetic” view of economic and social justice. No doubt Harvard Business School needed a few more as well. Massie left active parish ministry behind (though he is still an ordained priest) when he received his doctorate and began teaching, but as he told me when we sat down for a long conversation at his home in Somerville’s Winter Hill last week, “I feel that all people of faith—just as I feel that all people—should be engaged in translating their most deeply held values into their private and public actions.” Of course, he added, we all constantly fail at this, but that’s no excuse for not trying. But even this doesn’t fully capture the person Massie is. His story, which he tells in his excellent 2012 memoir, A Song in the Night, is so improbable that no serious novelist would dare write it. Born in 1956 with classical hemophilia, a potentially deadly genetic disease that robbed him of his ability to walk at age 5 and confined him to leg braces and a wheelchair into his teens, Massie contracted HIV (though he was spared AIDS) and hepatitis C from blood transfusions as an adult, and would have died had he not received a liver transplant. The transplant, as though miraculously, cured the HIV, hepatitis, and even the hemophilia. Today, after almost a decade of new health, Massie says he is more energized than ever in his life. Massie wrote a prize-winning history of the anti-apartheid movement and created two sustainability organizations. Which is saying something. Through all of his health adversity, Massie taught for years at Harvard Divinity School; wrote the definitive, prize-winning history of the anti-apartheid movement, Loosing the Bonds: America and South Africa in the Apartheid Years; won the Democratic nomination for Massachusetts lieutenant governor in 1994 (when Democrat Mark Roosevelt lost the governor’s race to Republican Bill Weld); led Ceres, the international alliance of businesses, investors, and environmental organizations; created two influential sustainability organizations, the Global Reporting Initiative and the Investor Network on Climate Risk; and, following his recovery, became president of the New Economics Institute, leading its re-launch as the New Economy Coalition, a driving force in the movement to replace exploitive and extractive global capitalism with just and sustainable local economies. For the past two years, he led the Sustainable Solutions Lab at UMass Boston, with an emphasis on climate justice in low-income communities. I’ve come to know Massie as a fellow climate activist in the campaign for fossil-fuel divestment at Harvard, where we’ve at times worked closely, even engaging together in peaceful civil-disobedience protests. A powerful speaker (the preacher’s training doesn’t hurt), Massie is unafraid to lay it on the line when it comes to climate reality—as 350.org founder Bill McKibben said to me recently, “Bob has been an absolute staunch champion of serious action on climate; he has the same kind of consistency and integrity as Bernie.” So when I learned that he was running for governor of the state where I have lived for 25 years, I knew I had to talk with him. Because as much as Massie is committed to truth-telling on climate and climate justice, he knows that they are part of a whole complex of issues, social and economic and cultural, that if not tackled together won’t be tackled at all. If Massie wins the Democratic nomination, he will be on the ballot along with Senator Elizabeth Warren in her bid for re-election, at a moment when Democrats appear determined to hand Donald Trump’s Republican Party a historic defeat in the 2018 midterms, and against an incumbent who won the governor’s office by an historically thin margin. In other words, if Massie is nominated, he stands a pretty good shot at becoming the next governor of Massachusetts. Wen Stephenson: Why are you running for governor? Was there a particular moment? 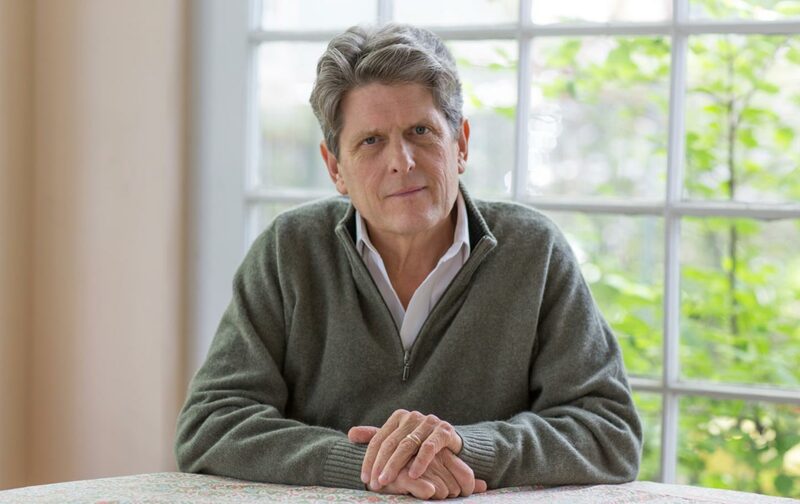 Bob Massie: My wife, Anne, and I were in Europe last fall on her sabbatical; she’s a professor of architecture and sustainable urban design, and we happened to be in Finland, where Anne was delivering a lecture. We had a dinner with some Finnish friends…and we were explaining how the Electoral College would prevent Donald Trump from becoming president…. We thought we’d get up at 5 in the morning and watch Hillary become the first woman president of the United States. So, we woke up at 5, and turned on the computers—and our life kind of exploded, as it did for a lot of people, and our minds exploded, in some ways. And after getting over an initial period of concern and anxiety and depression, we both realized we did not want to see everything we’ve worked for, for more than 40 years, be torn apart. And as I read the papers, one outrage after another, ranging from the appointments that Donald Trump made, including, in my judgment, the number-one climate criminal, corporate criminal, in the world, Rex Tillerson—making him secretary of state, that’s an abomination—and on and on and on: Trump’s policies, his mannerisms, his lack of qualifications, and his active intent to destroy some of the most important values and institutions in the United States. So, I come back here right before Christmas, we’re approaching the inauguration, and I’m hoping that our governor, Governor Baker, will start drawing a line as to what the limit is to the president’s behavior, in his active undermining of the Constitution of the United States. I view this as a fundamental question. And I see the governor saying nothing, on many, many occasions. And I see, as I look more deeply, that we’re just stuck, in Massachusetts. Superficially things are going well, but if you look just a little bit below the surface, we have deep structural problems in the economy that are perpetuating inequality. We have an inability to move rapidly on renewable energy…. And so, finally, it was really one of those things, of feeling, “If not now, when? If not me, who?” And also feeling, as someone who enjoys politics, who’s been successful at coalition building, who cares very deeply about the way issues are framed, and the way people imagine their future, I just decided that I had to jump in. And I have to say, there are many ups and downs and challenges of a campaign, but every single day that I go out on the campaign trail I have this sense of certainty that, whatever happens in the outcome, this is the right moment for people like me to be laying out an alternative vision of what democracy and what a sound ecological future can be.… I’m proud to be part of those candidates around the country who are rising up and saying, No, we believe the United States is and should be something different. WS: So how do you win? What obstacles do you have to overcome? BM: Right now, what we have in Massachusetts is a governor who has a high approval rating, who is doing almost nothing in the job. He has no long-term plans for modernizing our transportation system; he had to be forced under court order to obey the Global Warming Solutions Act; he has done virtually nothing around addressing the severe cost of higher education for most people. And on and on. The large structural questions that require you to lay out a vision and a plan for the next ten or twenty years, he’s simply not doing. But the difficulty is that people are used to having very, very modest ambitions. They’re used to being told that we live in a world of scarcity—so that’s not going to be possible, don’t even imagine that, that’s going to be too expensive, so you shouldn’t even think about what you really want, because we can tell you right now you’re not going to get it. And there’s a lot of people in the United States who have accepted this very depressing view of the future that is actually completely out of sync with, that is not the tradition of the United States, or particularly of Massachusetts…. We have more resources, more talented people, more energy, more technology, more creativity, more ability to communicate, and more people than ever before. This is the time when we should be bringing people together and saying, Let’s shoot for the moon, let’s think about what we really want, not keep settling for some tiny little baby-step version that we’re being offered today. Now, politically…to awaken people’s hope, to awaken their creativity and their imagination, that’s a challenging thing to do. Especially if you are running against candidates, or an incumbent who doesn’t see that at all. I think we saw this with Bernie Sanders. People are cynical—my longstanding view on cynicism is that underneath, if you scratch the surface of a cynic, what you find is a disappointed idealist. Somebody who’s very depressed and sad that all the things they would like to see are never going to happen. That’s a form of grief turned into anger. But if you can overcome that cynicism by saying to people, you can unlock some of those dreams, some of those ideals, and let’s give ’em a run here, people can be transformed. And I think Bernie is a good example of this. He said, we don’t have to be this way. We can change our banking system, we can change how the economy works, we can change how politics works, make it more open and less dominated by money. And he’s right. He’s right. And I think one of the great gifts Senator Sanders has offered us is just to change that frame of reference, and I think one of the reasons that some of Senator Sanders’s supporters were so upset about Hillary getting the nomination is that they felt, now this opportunity for deep transformation is going to get cut off. But I think what we’re finding—and this is the irony of Donald Trump—is that in fact it’s accelerating. There are more and more people jumping into races. I’m one of them, but there are thousands of people. There are all the groups that have been formed, there’s the amazing impact of groups like Indivisible, and there’s a sense now, a truly American and I would say patriotic sense, that this is our country and we are taking it back. And we’re taking it back not just because we want it for ourselves, but because we want to get back into the process of continuous improvement, continuously trying to reach those goals that are at the heart of the American canon that we all want to meet, and that I think lots of Trump supporters want to meet—they also have felt bitter, cynical, angry, deprived, and some of them are absolutely right, because they have been experiencing the slow death and strangulation of the American Dream, and the American Dream is something that’s held us together for 200 years. So I think that we are in a moment of potential dramatic change, and that’s why I think the proposal that the governor has, to just kind of continue with a steady-as-she-goes nothing—and then, frankly, my [Democratic] opponents, who are lovely people, they’re basically, their message is, I was a good manager of this, in one case a department, in another case a city, and I’ll be a good manager of that—that’s fine, but I don’t think that’s what the time calls for. WS: How do you deal with what Bernie referred to as the rigged political system? It goes way back. A lot of people, including Bernie people, would say it was there with the Clintons, and it was there with Obama.… So on the one hand, I hear you wanting to awaken that sense of possibility, but at the same time there’s the big structural obstacle of this plutocratic, corporate-dominated political system standing in the way. You have companies invading the political process at the state level, through groups like ALEC [American Legislative Exchange Council]. And at the national level, I mean, it is a complete outrage that they’re putting [Scott Pruitt] one of the toadies of the fossil-fuel industry in as the head of the EPA. That is a man who is so compromised by his views and his ties that he shouldn’t be a hundred miles from the EPA, and he’s in there doing as much damage to the environment and the people of the United States as he possibly can. This is one reason I don’t understand why people ignore politics. The future of our society, the future of our planet, are in play—right now—and the one thing that can overcome the forces that are pressing forward to deny us the things we need, the one thing that can stop them, is democratic engagement. But [those forces] understand that, so they do everything they can to dishearten us, to disenfranchise us, to suppress voters, to change the rules. In fact, I believe that the Republican Party has realized that the only way it can stay in power is by continuing to cheat—cheating in voter suppression, cheating in Citizens United, in redistricting, cheating in just about every way they can, to make sure that only the people who are likely to vote for them get to vote. That has to be fought against, but if people say, I don’t have any effect, they are playing into the hands of the most damaging forces in the country.… The apathy and the dismay, as understandable as they are, play into the hands of those who want to maintain antidemocratic power, and so the cynicism fuels or fulfills itself; it’s a self-fulfilling prophecy when you say, I don’t have any impact.… The kind of aggressive, energized, political activity that we’re seeing today is the key to rolling back these attacks. WS: So, I want to talk about climate. I was going to ask you what’s the “defining issue” of our time. Some candidates make it part of their opening bid—such-and-such “is the defining issue of our time.” And I’m always astonished and demoralized when climate change isn’t even in there, doesn’t even make the list. So let me ask you, is climate change an existential threat—within this century, that is, the lifetimes of young people alive today—for the Commonwealth of Massachusetts, the United States, human civilization? WS: And you’re comfortable talking about it in those terms? BM: Oh, absolutely. No question about it. WS: A lot of Democrats, never mind Republicans, don’t seem to think climate change is much of a crisis, let alone an urgent existential threat, because they barely talk about it. They’ll talk about renewable energy, but then, climate-denying Republicans will talk about renewable energy in their states. Is it possible to have a really honest conversation about climate change in this country, even among Democrats? And what would an honest conversation about climate—and, most importantly, climate justice—actually sound like in 2017? Why is it so difficult for many mainstream Democrats to have that conversation, or even to put climate front and center on their campaign website? BM: So, I believe that essential to political leadership, and to what I would bring, is honesty about the nature of the problems we are facing. So don’t sugarcoat it. Number two is a bold vision about what to do, not an incremental step. And three is a willingness to take action. Serious action. Now if you have honesty, if you have vision, and if you’re willing to take action, you can bring people along, and change the dialogue and transform what happens in the community or state or country. We have not had honesty. Our vision has been blurred or absent. And we have not been willing to take action. WS: How do we make the conversation about climate justice, the concept of a just transition, of resilience, starting with the poorest and most vulnerable communities, how do you make that conversation a central part—not just lip-service, not an occasional reference, but a central part—of the conversation about economic inequality and racial injustice, broadly, in this country? BM: [Climate] is often seen as a white, middle-class issue, and not directly connected to social-justice questions. That is a mistake. First of all, the people who are being harmed, and will be harmed, by climate change are overwhelmingly poor people and people of color, around the world and in the United States. I ran a program for the past two years here in Boston that focused on climate justice, called the Sustainable Solutions Lab [at UMass Boston].… Boston could lose as much as a third of its land mass under sea-level rise, and with the other elements of storm surge and heat islands, and so forth, the city is going to come under unbelievable pressure. Some of [the affected places] are wealthier neighborhoods like Back Bay. One of them is the Seaport District—where, idiotically, we’ve put $2 billion of new investment in the most likely place to flood. But it’s going to have a horrific impact on where poor people live, in Mattapan and East Boston, and even in Roxbury, which is on slightly higher land. All of these places. And so all of the problems that these communities are already facing, around unemployment and poor health and displacement and gentrification, all of those forces are going to become dramatically worse. And yet, it will be the relatively privileged groups that will go to the legislature and say, bail us out first. So this tension is between people who say, rescue us from climate, and those who are under the severe impact of disenfranchisement and low income, who say, this is a social-justice issue that is just going to get worse, unless we address it now. So we were able to bring a lot of people together, community leaders, people of color, and we have been able to start carving out a set of actions that we call Joint Resilient Actions, so they increase social resilience and they increase climate resilience at the same time, instead of having these be set in opposition to each other, where you spend on one or spend on the other. And our claim, supported by a lot of different groups now, is that every dollar that we spend from now on should be evaluated by what it does for both. WS: Can you give one or two examples of something that’s both social resilience and climate resilience? BM: One is, you can invest in local neighborhoods and make them more energy efficient, and plant more trees, and make them more resistant to flood damage, or to storms and heat—and that also increases their social resilience because you’re making safer communities, you’re making more beautiful communities—but you’re also running into the likelihood of gentrification. So you improve a neighborhood, and you make it less vulnerable, and that’s good, but often then you start to force poor people out. Another is, if we build an X-billion-dollar harbor barrier, who’s going to have those jobs? Is it going to be the poor people in the communities that line the harbor? Or is it going to be people imported from somewhere else? Or given to a global contractor who doesn’t care about local employment? Or, for example, if you’re going to build new infrastructure to be climate resilient, could you add a transportation line on top of that wall or whatever it is you’re doing. The extent of our failure to think in an integrated way has brought us Seaport, because the city approved it, and architects designed it, the bankers paid for it, and the insurance companies insured it—oh, and GE even put their headquarters there—and the whole thing’s going under water. So we can tell, right from the start, there’s been a lack of integrated thinking. And the 21st century, 22nd century, must entirely be about integrated thinking, the relationship between all of these pieces—employment, education, job creation, wages, environment, climate change, transportation, housing, all of these pieces, they all fit together—and as long as you keep them in different boxes and pursue policies that are unaware of each other, you are going to lose the thread and start doing things that are even counterproductive. WS: So how do we actually integrate climate justice and economic and racial justice, at the community level? WS: Getting them out of their silos. BM: Exactly.… So creating that space, that’s the first step. And that’s something that a governor is uniquely able to do.… If the governor says, we are having a conference that puts this absolutely at the center, and I’m going to be there the whole time, and I’m asking the head of the Greater Boston Chamber of Commerce and the head of the climate program at UMass Boston, the different pieces, and the community leaders, the people of color, who are used to being ignored, and we bring them together and talk this thing through. And then what happens is—and this is one of the most powerful things I’ve learned—people do not have to have the same reason for doing the same thing. You can agree on an approach, and some people can be because it’s climate, some people because it’s jobs, some because it’ll make money, but you can agree on an outcome, because there are multiple reasons to do it, instead of fighting about who’s got the best reason, which is mostly what we do. So you bring people together. Then there’s…the culture of scarcity. This is a false idea, introduced by economics, that says that almost everything is a tradeoff. You can either do this, or that. The reality of life, and in fact most of what business is based on, is the notion of a joint gain, that is, you can do more of both.… There are solutions that can both protect the planet and advance jobs. This is why the idea that there was some tension between job creation and acting on climate change was false from the beginning. Because there’s always this possibility—the number of places where it’s actually a strict tradeoff is very small. But we act as though it’s present everywhere. And that’s a key insight. I mean, a lot of these things are pretty basic, but they get forgotten in the process. The concept of joint gains. The concept of integrating outcomes. The concept of bringing people who are actually affected by the outcomes [into the process].… Politics should be about bringing different people together to seek the dramatic joint gains that no one thought were possible before. WS: I always feel it’s my job to bring it back to climate reality—to physics and chemistry—and the truth is, we’re behind the eight ball. WS: We’ve probably lost the so-called “permanent” Arctic sea ice…. We face an existential threat, an emergency situation. It’s a global problem, a global emergency. So, what can Massachusetts do to make a difference? You’re using terms like “transform,” not the status quo language about renewable energy; you say we have to “transform our energy system.” How do we move the center on climate, so that the things that are necessary but outside the political mainstream, considered radical, crazy ideas—like, zero carbon emissions by 2030, or even zero by ’50—so that those things are understood as reasonable, pragmatic, necessary steps? BM: We have been stuck in a cycle of self-reinforcing ignorance that goes something like this: Because people cannot see the direct connection of climate change in their immediate day to day lives, when they’re asked about it, it polls down at number ten or twelve, and this has led to a wide outbreak and permanent condition of cowardice among our leaders, whose job it is to point to problems that are approaching us and act on them…. And what I talk about on the stump—yesterday I happened to be in Agawam, which is a middle-class town right outside of Springfield, and I talked about this, and people were extremely engaged, thus giving the lie to the notion that there is no interest in this. WS: You were talking about renewable energy and climate together? BM: Absolutely. And what I said was, to take one example, Denmark—which is slightly smaller than Massachusetts—because they committed 20 years ago, is about to hit 50 percent of their total electricity demand coming from offshore wind. And I contrast that with the first five offshore windmills getting going in the United States, off Block Island, last November. And I talk about, not only do the Danish have clean, renewable energy, they structure the equity so that often the local people have shares, so they get clean renewable energy and a check. And then, if we have time, I go into what distributed energy would mean for their pocketbooks, for their freedom from fossil-fuel long-term expenses, pipelines, utility decision making, and people get that.… You don’t have to be a deeply engaged environmentalist or a college graduate or anything, people get it like that. So if we had a governor who was driving around in an electric car, who starts to move the entire state fleet to electric, who pulls together all the CEOs in the state and says, Look, you know this is a problem, I know this is a problem, you need to be seen as leaders, I will support you, how fast can we move? And who is not being influenced by the failing business model of utilities, which are dying, and should die—or more correctly, should be transformed into something that makes sense. WS: Do you think Massachusetts Democrats are on board? BM: This is the state that worships the Kennedys, and the Kennedys never said, “Hey, what do you need? We’ll get you that.” They said, “We’re going to the moon, not because it’s easy, but because it’s hard.” I campaigned with Teddy Kennedy in 1994, and every time he got up, he said, “the challenge of America,” and “the challenge we must face,” is this and this and this—and people loved him for it. And that’s the piece of politics that people in Massachusetts have forgotten, and that Americans have forgotten, but is right there, ready to be revived.